The McLean High School Booster Club mission is to provide financial support for McLean Athletic Programs. We raise money to benefit athletes, coaches and the facilities on which they practice & play. We provide support through parent volunteer fundraising activities and community business sponsorship/donations. Our goals are to promote positive community relations with parents, administration, faculty, students, alumni, and the greater McLean community to make our athletic programs the best they can be. We are a parent volunteer organization. We can only succeed in our mission with your support. We warmly invite you to join our team! Snack Bar Volunteers Needed! Please Contact the Booster Snack Bar Coordinator for Volunteer Details & Availability! The Booster Club at McLean High School works primarily to support and assist the athletic teams. They promote positive sportsmanship, parent networking, and opportunities to connect as a part of the McLean Athletic family. The Booster Club is open to any individual who would like to help advance and enhance the sports teams. One of the primary fundraising activities is the sale of concessions at sporting events. Volunteers work with other McLean High School Clubs and Organizations to organize and maintain concession sales. There are also numerous calls for help throughout the year. Once you join the Boosters - we will keep you posted on opportunities to pitch in and help out. Please don't hesitate to join us - all are welcome! Booster membership included with every Booster Pass purchase. Booster membership is included with every Booster Pass purchase. Membership is also available for a $40.00 yearly fee. Join the crowd to cheer on our athletes for all McLean High School home games! Purchase a Booster Membership Pass and receive your ticket to all regular season home games for all sports throughout the entire school year. Family, individual, and student passes are available. All levels include membership to the McLean High School Booster Club. Need a Coach's gift? Special Gift for a Special Teacher? Graduation present for your Senior? Alumni – want to make your mark on McLean HS or honor an old Friend? The MHS Athletic Boosters has just the thing you’re looking for! Add a brick to our “Scotty Walk” at our Stadium Field entrance or choose to have your brick placed by our Baseball Stands or Softball Walkway. This year the Booster Club will be planning several fundraising events throughout the season such as The McLean Holiday Pop-Up Bazaar, Local Restaurant Fundraising Nights, The Spring Golf Tournament, and more! Please join the Boosters, by participating in these events, and volunteering; you will be making it possible for the current and future MHS student-athletes to experience all the wonderful things that come along with being a McLean High School student-athlete - and also connect with our community. We can't wait to see you this year! Please support those who support you. Each one of us has a key role to play in creating vibrant community relations between our school and the local business who support us. We hope that you, our McLean parents, faculty, alumni, and athletes provide a powerful impact on the business that supports us by rewarding them with your business. Every year, our local sponsors write generous checks, purchase advertising, provide services and support to the McLean Athletic Community. We have a page dedicated to our local community sponsors to make it easy to try to "shop local" first, celebrate where we live and thank the local business that supports us. *McLean High School Spirit Wear available during select events at McLean High School! 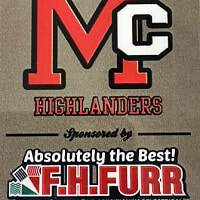 Get the latest on McLean Athletics - Check out The Highlander! The Highlander is the student-run newsmagazine of McLean High School. They do a professional job of covering McLean High School Athletics - great content, game recaps, photos, news & more!